Good news! America’s most concerning first world problem might finally be solved, if you’re willing to properly accessorize. M3D, makers compact 3D printers, have designed a pair of earbud-catching earrings that promise to save your Apple AirPods from falling into the toilet when they inevitably slip out of your ears. The M3D Twisty Earbud Catchers aren’t available for sale anywhere, however. You’ll need access to a 3D printer in order to create a pair for yourself, or you can hire one of the countless 3D printing services available online and have them shipped to you. 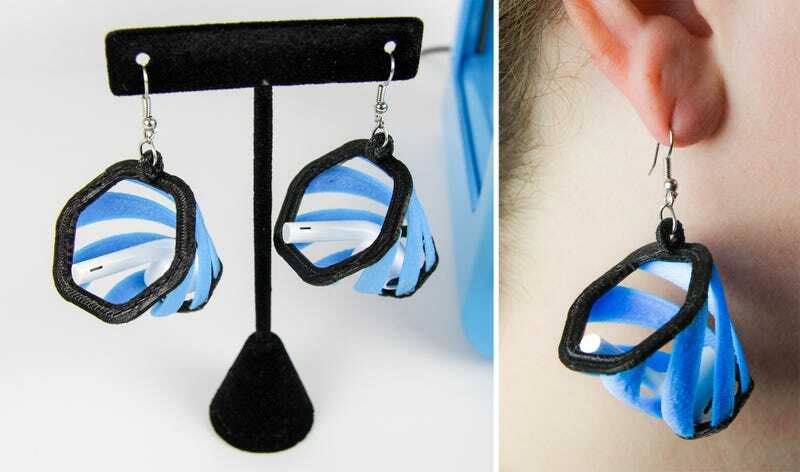 M3D has posted the necessary 3D files for the Twisty Earbud Catchers on Thingiverse for anyone to download for free, and while they might not be the most stylish solution to securing Apple’s untethered AirPods, most newer 3D printers let you mix and match colors so you can customize the earrings to some degree. Welcome to 2016, where self-driving cars are finally becoming a reality, and we now need special earring baskets to protect our pricey $160 headphones. Are Apple's AirPods the next Newton?